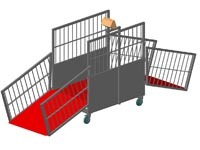 One of our latest products/design is a trolley with integrated weighing scale for pigs with on both sides a foldaway platform. 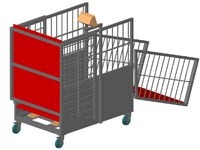 The trolley has an integrated weighing platform; size: 743*1250mm (w x l). At one side of the trolley a display holder for the weighing module is placed. The weighing module consist of a terminal and 4 weighing modules. 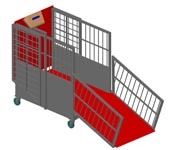 The system has a maximum weighing capacity of 452kg.